Increasing scoring in the NHL: Angled goalposts, bigger nets, smaller pads, or nothing at all? Ever since Mike Babcock, the head coach of the Toronto Maple Leafs, mentioned that the size of the nets should be increased, the NHL world has been discussing ways to increase the amount of goals scored in the league to cater to the more casual fans. In this day and age, where people seem to have the attention span of a goldfish, everyone wants high scoring games. In the eyes of the casual fan, a 5-4 score line every night is ideal, offering lots of action and fun. The wider the appeal of the sport, the more fans and revenue the league pulls in. Unfortunately, some people don’t seem to appreciate the great defensive battles and goaltending duels that the modern era of the NHL offers. Remember the Rangers series against the Capitals last season? Every game was decided by one goal, the games finished 2-1 or 3-2 and both teams still had like 30 shots on goal. Henrik Lundqvist and Braden Holtby battled it out, and it was awesome and intense. But the league seems to be leaning towards attempting to increase scoring, bringing hockey back to the golden era of the 1980’s and 90’s, when the average hockey game produced seven or eight goals and scoring 100 points or 60 goals was a commonplace. Wayne Gretzky put up 215 in the 1985-86 season, and Mike Bossy had over 100 points and more than 50 goals for seven straight seasons. Last season, Jamie Benn won the Art Ross trophy by scoring 87 points, the most in the league. It was the first time since the 2003-04 season that the Art Ross winner didn’t score 100 points or more (except the lockout season in 2012-13). There were an average of about 5.3 goals scored per game, and the average save percentage was .916. Carey Price won the Vezina Trophy with an impressive 1.96 GAA and a .933 save percentage. Flashback to the 1992-93 season. There was an average of 7.2 goals per game, and the average save percentage for a goaltender was .885. Mario Lemieux won the Art Ross Trophy by scoring 160 points (69-91-160) and Ed Belfour won the Vezina with a 2.59 GAA and a .906 save percentage. That’s a massive change in the league in just 22 years. Scoring has gone down and performance from the goalies has gone way up. But is 5.3 goals per game really a “lack of scoring?” Not really. Three and four goal outbursts from a team happen quite frequently. And more scoring doesn’t always mean better hockey. If you don’t find a goalie battle exciting, where a game is heading into the final minutes tied 0-0, then you’re watching the wrong sports. Every shot attempt brings anxiety, and whenever the puck is in your favorite teams’ zone, you get nervous. It’s a thrilling scenario to be in as a fan. Personally, I’m fine with the way the league is right now. I think there is just enough scoring to keep things interesting, but there are also the intense, low scoring goaltender battles. That variation keeps things interesting and exciting. This is the most common suggestion, and the stupidest one as well too. It’s a cop-out for teams that can’t score goals because they aren’t as talented, and it’s what people suggest without thinking how big of an impact it would have. First off, as Nashville goalie Pekka Rinne pointed out, it would wipe out the meaning of all of the past goaltending records. It would be like shortening all of the fences in the MLB, or making every NFL field 50 yards to increase scoring. It just doesn’t work. Also, bigger nets means goalies have to cover more space, obviously. That means they’ll be beaten on more normal shots. That essentially leads to a style of play where possession and tactical game plans don’t matter, and teams just shoot as much as they can. Scoring becomes less about making plays and being creative, and more about who can place their shots better. Players can be pure shooters in this league today, just look at Alex Ovechkin or Vladimir Tarasenko, but bigger nets would mean that everybody could do that. Simply put, don’t chance the size of the nets. When people talk about the increase in average save percentage and the decrease in average goals against, a lot of the finger pointing goes towards the size of the goalies, and the size of the equipment. Mike Richter was 5’11”, an average height for a goalie back in the 80s and 90s. Today, the only NHL goalie I can think of at that height is Jonas Enroth, the backup for the LA Kings. 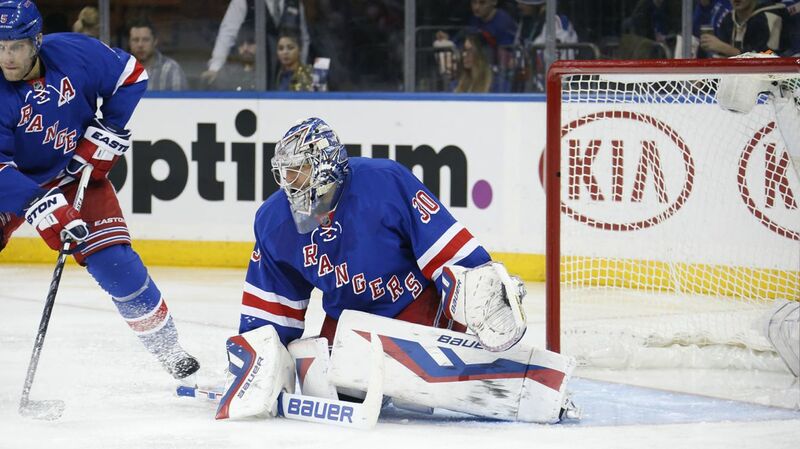 Henrik Lundqvist is 6’1” and analysts always talk about how he has to compensate for his “small size” with his goaltending style, his incredible reactions and attacking the puck from the goal-line out. Everyone is looking for taller goalies. 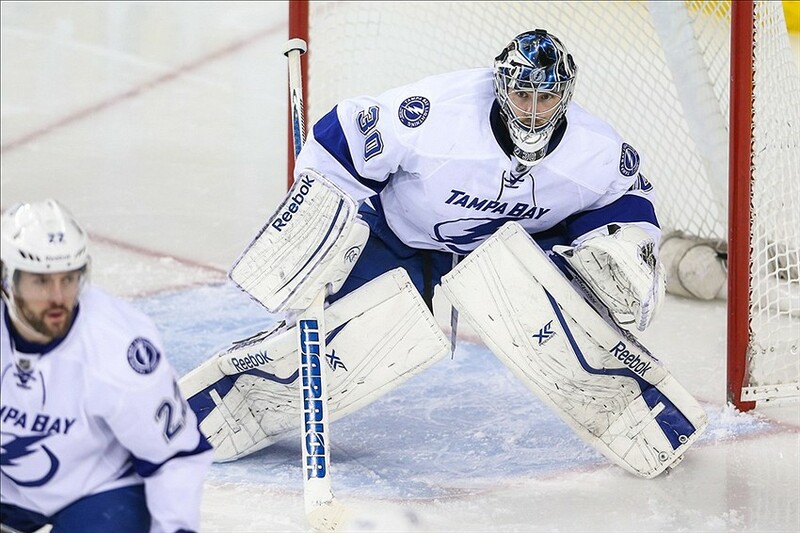 Ben Bishop is 6’7”. Devan Dubnyk, Scott Darling, and Anders Lindback are 6’6”. Pekka Rinne, Darcy Kuemper and Robin Lehner are all 6’5”. Martin Jones, Steve Mason, Kari Lehtonen, Mike Smith, Eddie Lack and Reto Berra are all 6’4”. Photo courtesy of Sergei Belski – USA TODAY Photos. In fact, the average goalie in the NHL is 6’2”, a far cry from the average height of 5-foot-11 from about 20 years ago. The height and size of the goalie does need to be taken into account. The size of the equipment has really increased too. Pads, glove, blocker, chest protector, everything. Goalies are taller and pads are bigger. It makes sense why less goals are being scored. I don’t think the leg pads are a problem. Goalies still tend to get beaten down low pretty regularly, so there doesn’t seem to be a problem there. However, I wouldn’t be against decreasing the size of the chest protector, which is honestly massive. When Bishop is hugging the post, there is almost no room over his shoulders. The safety of the goalie is of utmost importance, and that cannot be compromised. But a Kevlar vest can stop a bullet and it’s thinner than the chest protectors goalies wear. I think we can develop smaller hockey equipment for the upper torso. 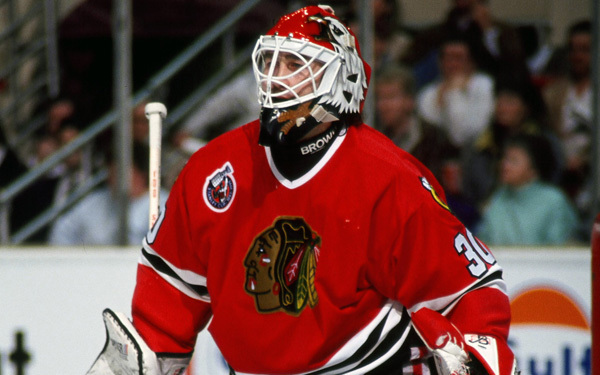 People need to take into account the fact that goalies have gotten, much, much better over time too. The style of goaltending has allowed for them to cover more of the net, especially down low, as well as make more reactionary saves. Also, the stand-up style has been phased out and goals like this don’t happen anymore. This is a suggestion that I only heard recently, and Wayne Gretzky has recently come out and spoke in favor of bringing angled goalposts into the NHL. This isn’t the first time it was suggested. Francois Allaire, currently the goalie coach for the Colorado Avalanche, recommended it about a decade ago. Currently, the posts are rounded. With a round post, the puck is more likely to deflect away from the net when it hits. It’s like a baseball bat. Because it’s round, the ball has to be hit a certain way in order for the ball to go where you want it to, and there is a small margin for error. It’s the same thing with a puck and a crossbar. Instead of rounded posts and crossbars, have them flattened and angled inward towards the net. That way, a puck is more likely to go in when a player strikes iron. It won’t be a massive change, but it’ll be enough to see a slight uptick in scoring. Also, this idea doesn’t fundamentally alter the game, and it would be extremely easy to test out in the AHL or elsewhere. This is a good way to increase scoring, reward players for hitting the target as well s preventing a major change in the sport. Again, I’m fine with the league the way that it is. And I know others that feel the same way. Sure, the 1980s may have been fun with the high scoring games and 160 point players, but today’s league is a better, more skilled league. The players are quicker, the shots are harder, the plays are more creative, and the goalies are better than ever. There are no more 45 foot wrist shot goals past a guy that’s standing up in the crease because the style of goaltending is greatly improved. And this year, we’re seeing more goal scoring and more high scoring players. Patrick Kane has 42 points in 27 games this season. Jamie Benn and Tyler Seguin both have 35 points already. Erik Karlsson, a defenseman, has 32 points. And even with all that, we still have goalies with outstanding stat lines, like Henrik Lundqvist and Braden Holtby. The NHL is in a really good place right now when it comes to the product that is on the ice. There isn’t really a need to change it, and I hope they don’t rush to make a change when the league is better than it has been in a long, long time. Posted on December 7, 2015, in In the Crease and tagged angled goalposts, Babcock bigger nets, Ben Bishop, bigger hockey nets, Billy Smith, Ed Belfour, Henrik Lundqvist, increase hockey goal scoring, Mike Babcock, NHL, NHL bigger nets, NHL goal scoring, smaller goalie equipment, smaller goalie pads. Bookmark the permalink. Leave a comment.